Moving in Breaths: Ji Young Yi, Jeong-Seung Kim and Sook-Kyung Hwang of the Contemporary Music Ensemble Korea. WHEN AMERICANS think of Korea, they might think about the Korean War or the country's subsequent partitioning into a socialist north and a capitalist south. Others may think of the Korean dish kimchi, pickled cabbage. They probably don't think about the kayageum, the 12-stringed dulcimer unique to that country. In 'Koreamerica', New Music Works Ensemble teams up with Contemporary Music Ensemble Korea to bring Santa Cruz not only the kayageum but also a sampling of Korea's musical traditions, as well as more modern approaches to Korean music. Yi Young Yi, Jeong-Seung Kim, Chi-Wan Park and Sook-Kyung Hwang of Contemporary Music Ensemble Korea, a group dedicated to propagating the new Korean music, are all considered national treasures in their home country. 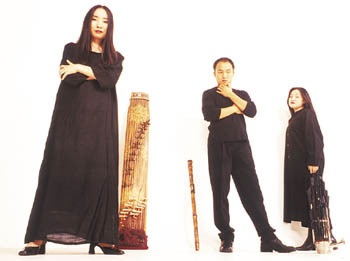 The concert (the first of New Music Works' 2001 season) showcases revivals of traditional court music (which have been arranged by local luminary Lou Harrison) and contemporary compositions for Korean and Western instruments, offering listeners a wide spectrum of this fascinating music. What is even more exciting is that the Santa Cruz audience will be the first to hear four of the seven pieces, two of which are world premieres and two of which are U.S. premieres. While the majority of the composers are world-renowned Korean artists, Yuji Takahashi, the influential Japanese composer, and Santa Cruzan Phil Collins have also added to the mix, composing Korean-inspired works for traditional Korean instruments. Though often characterized as a victim of cultural assimilation by neighboring China and Japan, Korea boasts a 5,000-year history and a national dedication to retaining and fostering its distinct and independent traditions, including a musical tradition unlike any in the world. Yet in an era in which pop stars like Sting and Madonna have popularized world music, Westerners still seem more comfortable with Cuban or African rhythms. Nonlinear Asian music remains generally inaccessible and often misunderstood. "Korean music has no sense of harmony whatsoever," says Hyo-Shin Na, whose world premiere of Chung-Ji-Hyang concludes the concert. "Saenghwang [a mouth organ] which I used in my Chung-Ji-Hyang, is the only harmonic instrument in Korea, and it has not been used much because it's not needed since they don't use any harmony. The instrument almost vanished. Korean music doesn't have any arpeggios or even two notes together." Na explains that she has left certain details of the music to the players, "suggesting that they search for new ways to realize these details without stepping outside the boundaries provided by the techniques of traditional music." Works by Na, who lives in San Francisco, have been performed all over the world. Among many other distinctions, she was awarded the coveted Korean National Composers Prize in 1994 and the Asian American Arts Foundation Fellowship last year. In 1999, the Kronos Quartet commissioned and performed Na's Song of the Beggars throughout the world. Currently, she is working on a piece commissioned by the Philharmonic Guadi Vienna. Na says that her study of traditional music in her earlier years has had as much influence on her as Western composers like John Cage, Morton Feldman and Conlon Nancarrow. "I'm not interested in writing 'Korean' music," she says, "but new music for traditional instruments, just like what I do for Western instruments." HYO-SHIN NA'S PIECE Chung-Ji-Hyang, named after the musicians who will perform it, is written for traditional instruments: the taegum, a large bamboo flute that produces piercing treble tones; the piri, a bamboo oboe; the saenghwang, a mouth organ with 17 slender pipes that produces a soft, dry tone; and the peopgeum, a court kayageum, the most popular Korean instrument. The kayageum, invented about 1,500 years ago, is a 12-string dulcimer, or zither, with movable bridges that is plucked while sitting cross-legged on the floor. It yields a serene and reverberating sound. Na, who composes for both Western and Korean instruments, says she doesn't divide them into two separate categories. "I take each instrument individually, whether Western or Eastern," she says, though she admits there are differences. "Korean instruments were made to be heard by the players themselves or by a small group of people," she explains. "They were used before the age of concert halls. ... When I write a mixed chamber work for Western and Korean instruments, like Blue Yellow River [also on the concert's program], [this] becomes an issue. I also try not to just imitate the usual gestures of either group of instruments." Also on the program is a piece called The Mountain Spirit, by the celebrated composer, performer and scholar of Korean music Byung-ki Hwang, whose works range from the strictly traditional to the highly experimental. Hwang is credited with developing and teaching a unique version of sanjo, the traditional musical form for the kayageum. Like a lot of Korean music, The Mountain Spirit is inspired by isolation and nature. Composed for kayageum and taegum, it mixes classical and folk idioms, conjuring cinematic images of lush landscapes shrouded in mist and a mood at once melancholy and joyous. The Mountain Spirit moves in breaths, unlike heartbeat-based Western music. It moves not toward any expected chorus or reprieve, but like the wind ruffling long grass. Its dramatically shifting tempo, if it can be called that, falls from a gallop to an excruciatingly slow meditation, abruptly switching from forte to pianissimo in such a way as to create a kind of 3-D effect. Korean music employs a nonmetrical, or elastic, rhythm. Such rhythm cannot be taught using the West's metronome. A Korean music master teaches students rhythm by having them sit cross-legged. The student then slowly beats the palms of his hands on his thighs, measuring the time it takes to exhale. The master tells him that the breath represents the length of a five-beat pattern, about the same amount of time it takes to sing one phrase of a Korean song. When he's teaching his students at Cabrillo College about Korean music, Phil Collins, founder of New Music Works Ensemble and composer of one of the concert's Korea-inspired pieces, tells them to listen to how it works in threes, like swing. "There are very slow rhythms, with syncopation inside," he says. "Korean music is the only Asian music that goes outside double time. Another reason why there is a close similarity between Korean music and swing and jazz is that both play around the beat and there are these suspended beats that tie across, leaving a lot to implication." All of the pieces on the program promise to go beyond the usual concert-going experience. For the U.S. premiere of Kayageum Nado Asobi, Yuji Takahashi instructs the musicians to "stay [as much] out of tune as possible" and to not "play self-assertively. Sounds are uncertain," he writes, "ambiguous, faltering, transient, and a little out of control." Bonu Koo's Canti di bocca chiusa e melisma, another U.S. premiere, employs a traditional Korean singing technique, somewhat similar to a falsetto, no longer performed on modern Korean stages, whose players prefer bel canto-style singing. In this piece the lid of the grand piano is removed in order to optimize the reverberations and echoes that such singing produces upon its strings. "The Korean community really came together to make this concert possible," says Collins. "We've been receiving checks in the mail from grocers in Salinas, and Shogun [a Japanese restaurant with a Korean chef] has offered to feed them [the musicians] the entire time they're here." Koreamerica takes place Sunday (Feb. 4) at 7pm at the Music Recital Hall, UCSC. Tickets are $13-$15, available in advance at UCSC ticket office, SC Civic Box Office and Streetlight Records. For more info, call 831.429.2277. From the January 31-February 7, 2001 issue of Metro Santa Cruz.